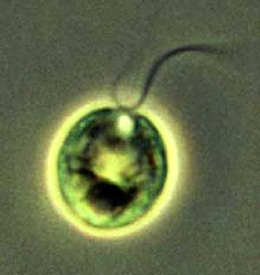 An image of Chlamydomonas used in the study. Credit: Surzycki, et al. © 2007 PNAS. For several decades, scientists have known that certain species of algae can produce hydrogen in anaerobic conditions. More recently, researchers have been trying to take advantage of this ability to produce hydrogen that could be used by fuel cells to generate electricity—without expensive processes like electrolysis required for splitting water into hydrogen and oxygen. Now, a team of biologists including Raymond Surzycki and Jean-David Rochaix from the University of Geneva, and Laurent Cournac and Gilles Peltier, both from the Atomic Energy Commission, the National Center for Scientific Research, and the Mediterranean University, have demonstrated a new method for hydrogen production by algae. In a recent issue of PNAS, the team presented a method using copper to block oxygen generation in the cells of Chlamydomonas reinhardtii that could lead to a consistent cycle of hydrogen production. In order to induce hydrogen production in the algae, cells must be placed in an environment without oxygen but with access to light. To completely deplete the algae’s oxygen supply, the researchers turned off part of a chloroplast gene required for oxygen evolution by adding copper to the cells in an enclosed chamber. Specifically, the addition of copper turned off the Cyc6 promoter, which drives the Nac2 gene, which is required for photosystem II (PSII) synthesis. PSII generates oxygen. Within about three hours, nearly all the oxygen was consumed by respiration, and the algae reached an anaerobic state. Without oxygen, the algae began to synthesize hydrogenase and then produce hydrogen. One of the most significant differences between this method and earlier methods is using copper addition rather than sulfur depletion to repress photosynthetic activity. In past experiments, when the cells’ sulfur was depleted, the cells stopped growing and died after a few days. However, when adding copper, the biologists observed that the cells remained healthy. The rate of hydrogen production in the plants with copper was slightly lower than that of sulfur-depleted plants, but comparable. The scientists also observed that, in healthy cells, the Cyc6 promoter doesn’t stay repressed for long due to “anaerobiosis”—the ability of the cells to survive (and repair) with lack of oxygen. Subsequently, PSII activity is restored, and the cell returns to producing oxygen. However, as the scientists point out, this apparent limitation may turn out to be an advantage, since the procedure could be repeated over and over again. Through the alternate expression and repression of the Nac2 gene, the researchers have opened up the possibility of establishing a cycling hydrogen producing system. The development of the Cyc6-Nac2 system for controlling chloroplast gene expression can be applied to any chloroplast gene, as the researchers further demonstrated in the study. The method could therefore help scientists investigate the roles of different plant genes in live cells and genetically modify plants, including modifying Chlamydomonas to increase hydrogen productivity. He explained that one option might be to establish a cycling system in which photosynthesis generates reducing power with starch, which can subsequently be used to feed the hydrogenase once anaerobiosis has been achieved. He added that several laboratories are making efforts along these lines. More information: Surzycki, Raymond, Cournac, Laurent, Peltier, Gilles, and Rochaix, Jean-David. “Potential for hydrogen production with inducible chloroplast gene expression in Chlamydomonas.” Proceedings of the National Academy of Sciences, October 30, 2007, vol. 104, no. 44, 17548-17553.